The modest but growing Dojo was able to win 11 medals by 9 competitors. Olivia won Gold in Kata and silver in Kumite, Iain won gold in Kumite. Brothers Ben and Jackson took silvers in Kumite with Jackson winning silver in Kata and Ben getting the Bronze in that event. Gwyneth finished with bronze competing against girls up to 2 years older than herself. 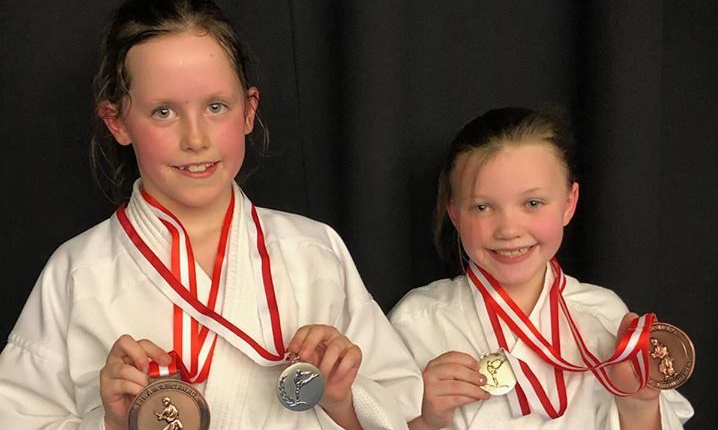 After five matches our newest competitor, Alex, won bronze in kumite along with Sienna who fought against two others taking home a bronze medal. Ewan and Madelyn both won Bronze in their respected age groups in the Kumite category. Sensei James Wyatt could not express enough how proud he was of his students. Thank-you to Sandeep Chaudhari from Domino’s Pizza for his ongoing support.